Getting the best from your Tailwell. In order to achieve the very best results from your Tailwell, there are a few important steps to follow for ongoing maintenance. Every 30-50 tails, to ensure continued good performance, undertake some quick maintenance. Look for any debris caught in the cutters (hair etc). If apparent, the cutters will need to be removed. cleaned and reassembled, then re-tensioned. (See section on Sharpening the cutters). 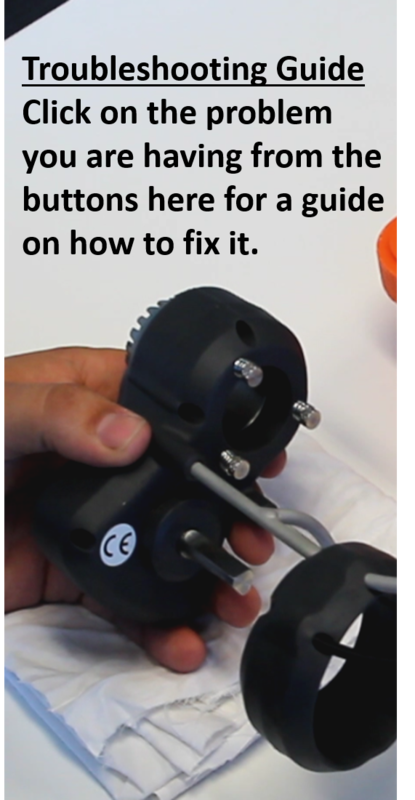 Check and if necessary, reset the cutter tension screws. Line the cutter teeth up behind each other so you can see the gap between the two rows of cutters. Tighten the three tension screws evenly to hand tight, then back off about an 1/8 to ¼ turn. Oil the cutters thoroughly using the Tailwell oil supplied. Using the tool even once with badly adjusted cutters can cause hair to get between the cutters and prevent proper performance of the tool. Line the cutter teeth up behind each other so you can see a gap between the two rows of cutters. Tighten the tension screws evenly to hand tight, then back off about an 1/8 to 1/4 turn. The Tailwell cutters should just be able to be turned freely by finger grip only. Not too freely and nor too tightly. IMPORTANT NOTE: If hair is caught between the Talwell cutters, cutting performane will be severely impaired. The cutter tension must be jept perfectly adjusted to prevent this. The Tailwell cutter will require sharpening from time to time. Follow the procedure below as well as watching the video on this subject. Remove the cutters from the Tailwell casing. Separate the inner and outer cutters. Clean all parts thoroughly with a clean cloth. Apply a thin coat of lapping paste (included in the Tailwell kit) to the outer face of the inner cutter. Use your finger to smooth out the paste evenly around the cutter. Place the two cutters together and rotate against each other for one or two minutes, until a smooth cutting action is felt. You should see an even and complete grinding surface on the inner cutter, which means the cutters are now sharp. If not, reapply paste and continue to rotate. Clean all remaining lapping paste from the cutters. This is important. Apply Tailwell oil to the cutters and reassemble the Tailwell machine. Re-adjust the cutter tension screws. Using the hex screwdriver supplied in your Tailwell kit, remove the six screws holding the case together. Once the case screws are fully undone, place the cutter teeth face down onto a clean rag and press firmly. This will separate the two cases. Inside you will see the Tailwell drive mechanism. Remove the cutters from the front case and separate inner and outer cutters. Remove the blue plastic rotator bearing. Thoroughly clean the cutters thoroughly of any build-up of grime and hair off the cuters. Once cutters are clean, re-lubricate them with Tailwell oil. Apply a thin film around the cutter edge, place cutters back together and rotate to distribute the oil. Check the sliding rotator bearing closely. If there is any sign of wear, replace it. Place the cutters down on the ends of the three tenson screws while fitting the rotator bearing over the driveshaft. Test your drive shaft, checking that the outer cutter oscillates side to side. Replace the front of the case. Re-assemble the casing, tightening the six screws in a diagonal pattern to ensure even pressure. Tighten only hand tight. Overtightening may damage or misalign the case. Tighten the three tension screws evenly to hand tight and then back off about an 1/8 to 1/4 turn. Oil the cutters thoroughly using the Tailwell oil. The Tailwell drive shaft should just be able to be turned freely by finger grip, not too tight or loose. The Tailwell unit can now be stored, ready for its next use.